Wouldn’t you rather have the money to choose where you will live? Debtors prison (long ago) was where you might end up until you could pay your bills or get someone to pay them for you. How does this relate to Long Term Care? Long term care is very expensive, and most Americans have not prepared for it. When an assisted living facility costs $4000/month for hands on care or $8000/month for dementia care, most people go broke and turn to Medicaid. Medicaid often pays less than the cost to care for you so many assisted living type facilities may decline to take you in if you cannot show an ability to pay for two years with money or LTC insurance. Nursing homes are different. Much of their work is in short term rehab after a hospital stay which Medicare pays for. This they can make money on to offset what they lose on their residents living there on Medicaid. Assisted living does not get such Medicare payments. Either you be able to pay for the care you need or go elsewhere. To keep their doors open they cannot lose money on every resident. If the nursing home accepts Medicare, then they must also accept Medicaid. Thus, if you have lots of money, or insurance for LTC, you can go where you want. 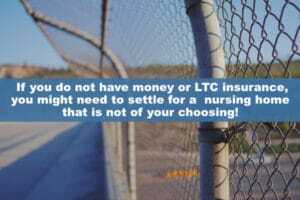 If you do not have money or LTC insurance, you might need to settle for a nursing home that may be your only choice due to finances. Now do you see the correlation to debtor’s prison? Wouldn’t you rather have the money to choose where you will live? If you don’t have the money, investigate LTC insurance – while still healthy enough to get it. It’s just like car insurance, you have to have it before you suddenly need it. Call TheLongTermCareGuy.com at 884-3030 and schedule a time to investigate.